Truckee's Michael Doughty brings down a Lowry runner during the Wolverines 39-8 win on Sept. 15. Doughty will lead the Truckee defense into battle on Friday night against Sparks. 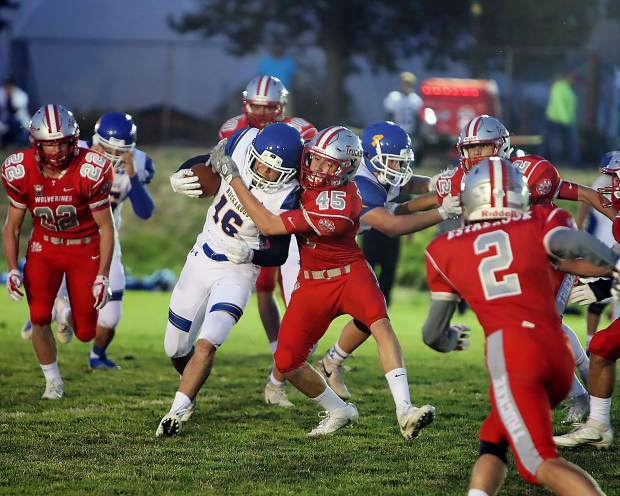 The Truckee Wolverines football team will head to Sparks High on Friday, Oct. 6, for a league contest as the team goes on the hunt for a fourth consecutive victory. Since losing 42-22 to Churchill County on Sept. 8, the Wolverines have reeled off three wins in a row, and have outscored their opponents 122-15 during that span. After wins against teams sitting near the bottom of the league standings, Truckee (5-1, 4-1 Northern League) will now see an uptick in competition when the Wolverines take on an upstart Sparks (2-4, 2-3 Northern League) team. The Wolverines own wins in 12 of the past 13 outings against Sparks, with the lone loss coming in 2006, but this year’s Railroaders have shown promise early on, and are a pair of wins away from the most victories in a season since 2010. The two programs have played common opponents this season in Dayton and Elko, with both squads earning a pair of wins in those games. Truckee, however, took both contests by a greater margin. Offensively, the Railroaders prefer to keep the ball on the ground, averaging nearly 200 rushing yards per game. Through six games, Sparks has handed the ball off nearly three times more than they’ve passed, despite trailing by large margins in three of the team’s four losses this year. Senior Jorge Dominguez carries the load for the Railroaders, averaging 4.7 yards per carry and a team-high 15.3 carries per contest. The 5-foot, 10-inch, 150-pound back has scored four rushing touchdowns this year. Junior middle linebacker Aleki Po’oi, 6 feet, 197 pounds, leads the Sparks defense, and has taken advantage of team’s four-man front, to rack up a team-high 37 total tackles. Truckee’s running game should provide a difficult test for the Sparks linebacking crew. The Wolverines have shown a lot of diversity and wrinkles in their ground attack, with eight Wolverines carrying the ball 15 times or more this year. Senior Jamie Parisi leads the team with 301 rushing yards, followed by junior Marcus Trotter with 250 yards and a team-high 36 carries. Junior quarterback Marcus Bellon has continued to impress both with his arm and his legs, connecting on 55 of 91 pass attempts for 948 yards, 16 touchdowns and four interceptions. He has also rushed for 201 yards and two touchdowns. Parisi has been his favorite target throughout the first half of the season with 14 receptions and five touchdowns. Defensively, senior linebacker Michael Doughty continues to lead the Wolverines with a team-high 49 tackles, including nine for a loss. Truckee’s defense has also proven to be opportunistic with seven forced fumbles and 10 interceptions this season. The matchup between Truckee and Sparks is scheduled for 7 p.m. on Friday, Oct. 6, at Sparks High.